Light is responsible for turning on the brain and the body. Light enters the body through the eyes and skin. When even a single photon of light enters the eye, it lights up the entire brain. This light triggers the hypothalamus, which regulates all life-sustaining bodily functions including the production of Melatonin. This necessary hormone affects every cell in the body. It turns on each cell’s internal activities, allowing them to harmonize with each other and nature. If that relationship is harmonious, we are healthy, happy, and feel a sense of well-being. An imbalance in this relationship makes itself known in the form of disorders or disease in our physical, mental or emotional states. Edwin Babbitt presented a comprehensive theory of healing with colour. He identified the colour red as a stimulant, notably of blood and to a lesser extent the nerves; yellow and orange as nerve stimulants; blue and violet as soothing to all systems and as having anti-inflammatory properties. It was his belief that by knowing the action of different colours upon the different organs and systems of the body, one could apply the appropriate colour that would balance the action of any organ or system that has become abnormal in its functioning or condition. The concept of chakras is essentially an east Indian concept in which the body has seven major energy centres known as chakras, each centre is responsive to a different colour. Chakras located at the sites of the major endocrine glands correspond to particular states of consciousness and personality types. 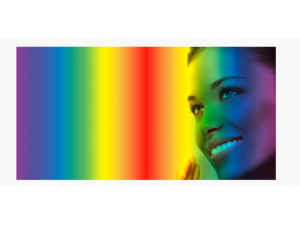 When we speak of colour, we mean energy waves and every colour with its own frequency is a form of energy. The tranquilizing effect of colours has found that certain colours reduce aggressive behavior and violence, and some Local Authorities have introduced blue lights into areas of anti-social behavior with positive results. Blue illuminated strips placed at the edges of railway platforms are being used successfully to stop people jumping in front of trains. You may have heard reference to “The Green Room” when people are waiting to go on air in a TV Studio, well this was historically a green painted waiting room, designed to keep people calm before going in front of the cameras, and its still referred as that today. 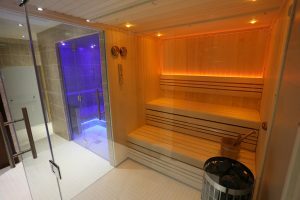 We can introduce the principles of Chromotherapy into our thermal areas in various ways, perhaps in the sauna we can include a specialist Chromotherapy light system which will allow for the programmed use of coloured light to stimulate the sauna bather. In the morning (reds, yellows and orange colours) will energise the bather, and changing to the cooler blues and greens in the afternoons and evening will offer a calming effect. Chromotherapy can be applied to steam rooms, and also into general relaxation areas, and it is now also possible to introduce Chromotherapy into our feature showers.